A little late on the bandwagon -only perhaps by a few years- but I got myself one of these personalised name necklaces. Always wanted one, since with a somewhat unusual moniker I could never find stationary or soft toys as a kid that had my name available in the generic store range. This makes up for it, happily. You can get one made here. 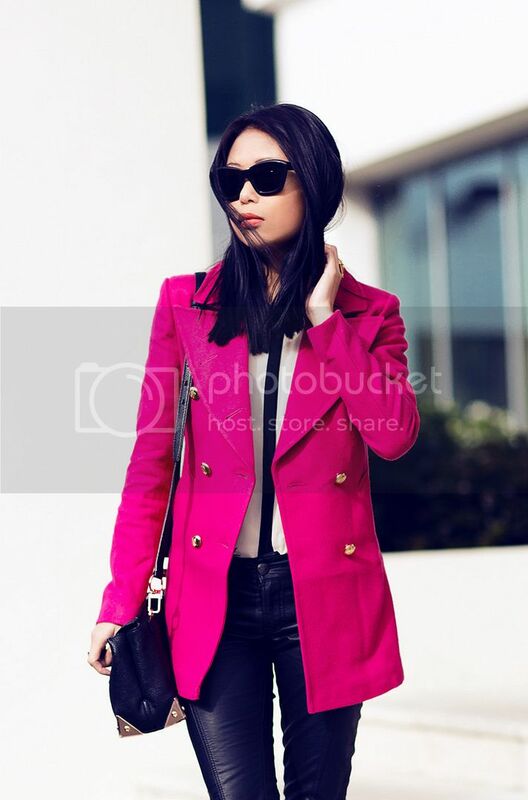 wow I love the fushia blazer! I just discovered your blog and I love it. Your still is amazing. What an outfit! love the pop of pink and the bag is gorgeous! Those pants are some hot ish! Love your jacket too, great look! I am pretty obsessed with this outfit! Everything is just perfect. So chic! Love the blouse and the statement necklace. Nothing is better for a day on the go than a great pair of leather pants. Loving this coat-such a great colour. Love this look so much! gorgeous! i looooove your blazer. Ahh so beautiful! I'm your newest follower! Love your blog! The Pop Of Colour In The Jacket Is Greaaaaat. Your hairstyle looks so chique on you ^^ Pretty.!! And I love the black-pink combo -- I have a short trench in the exact same color and usually pair it w/ black bottoms as well.